I first discovered Scotland's dark side when reading Roy Gill's Daemon Parallel about two years ago. This was a truly brilliant read that I thoroughly enjoyed. In fact, the book made my list of favourites back in 2012. Since that time I have been eagerly waiting for the sequel and finally it has arrived. With the recent launch of Kelpies Teen, this book is one of four due to be released in March. A revamped version of the cover of Daemon Parallel, with it's bright red glowing eyes beaming daemonically at you, is quite different to the original version. 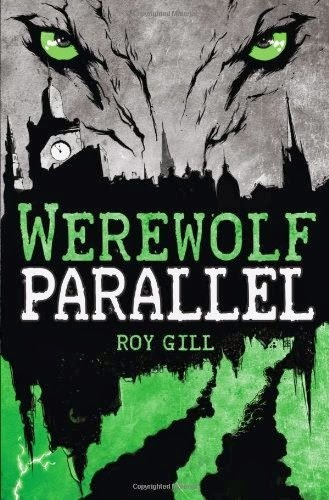 This is in-line with the current sequel, Werewolf Parallel, which has a very similar cover style but in green. Now that the anticipation is over and the book has been read, the question has to be . . . . was it worth the long wait? The opportunity to run with the pack again in another heart pumping adventure has been fantastic. I raced through the Parallel world turning the pages like a Daemon riding the Janus express train. The imagination Roy has applied to this instalment left me running wild through the Scottish countryside. Although, the next time that I walk down Princess street or Leith walk, my fantasy side will turn to the adventures in this book. I know that I will be making connections with elements of the story which, to me, shows that the story has really engaged with me on many levels. I will be running away from the malevolent beast known as Mr Grey, who has arms that endlessly stretch, as if they are continually growing and not to tickle you with! His fingers are waiting to strike you down whilst his sidekick, Mr Black, watches over you. They are planning to destroy the Parallel - the realm between worlds which is populated by daemons, dark fantastical creatures, old gods and werewolves - and everyone in it. The sinister plot that is afoot makes for a very interesting and imaginative story. The book definitely reads with a distinctive older feel, as it's now aimed at the teen market. However, I still feel that this book will be loved by younger people as well as the older population, like myself! This book is action packed with a pulsating adventure. It has a big wolf heart at the very core. Flowing with Scottish charm, this story has everything from spine tingling moments to emotional character enlightenment. It is difficult not to become wrapped up in the whole essence of the story and, before you know it, to be wolfing down each word. This is definitely a recommended read. By the light of the full moon, this story is both captivating and thrilling. I am looking forward to reading, what I hope will be, another exciting encounter. I will be giving away a copy of the Daemon Parallel on Twitter/ Facebook. All that you need to do is like my new Facebook page and comment on this review post at https://www.facebook.com/MrRipleyspage or retweet and follow me on Twitter, @Enchantedbooks. Apologies but this is only open to the UK due to postage costs. Closing date is Tuesday 1st April 2014.